A small Canadian cruise ship carrying passengers who shelled out thousands of dollars to retrace the route of a 20th century explorer struck an iceberg and sank hours later in the icy waters off Antarctica. Its reinforced hull gashed and taking on water, the MS Explorer slipped beneath the waves Friday evening, about 20 hours after its pre-dawn accident near the South Shetland Islands, the Chilean navy said. Initial reports suggested only a small hole was punched into the hull, but the Argentine navy later said in a statement it observed "significant" damage. Photos released by the Chilean navy throughout the day showed the ship lying nearly on its side, surrounded by floating blocks of ice. Andrea Salas, an Argentine crew member aboard the Explorer, was quoted as saying passengers felt an initial bump that seemed minor. "Then we heard the captain announcing that there was another iceberg approaching us and that he was waiting ... for it to pass by," she told Radio Continental in Buenos Aires. "But that didn't happen," and there was a second, larger collision. "They started pumping water out to keep the ship afloat" while the 154 passengers and crew members evacuated, said Salas, 38. After bobbing for hours in subfreezing temperatures aboard lifeboats and inflatable rafts, the 154 passengers and crew members were rescued by a Norwegian cruise liner, the Nordnorge, that answered the Explorer's distress call. Captain Arnvid Hansen of the Nordnorge, told CBS News Friday, "we have just finished this rescue operation, taken on board 154 passengers and crew members from the cruise vessel Explorer." The 54-year-old captain, speaking by phone to the CBS News London bureau, said all of those rescued were in "good condition". "Some of them are wet, but nobody (was) injured and the operation went very smoothly," he said, adding that his ship's medical staff had given everyone from the Explorer check-ups. Hansen said his ship was about five hours away from the Explorer, which started taking on water near the South Shetland Islands and Graham Land, an Antarctic peninsula, when he received the distress call. He said the evacuees spent most of that time in lifeboats, wearing emergency thermal suits. Wearing bright orange suits to fend off the bitter temperatures, their faces reddened by a blustery storm that delayed their landing, the rescued finally disembarked Friday night on King George Island in Antarctica where they were housed on Chilean and Uruguayan military bases. Authorities reported no injuries other than some complaints of mild hypothermia, none serious. Military officials hoped the weather would clear enough to airlift the survivors to Chile's mainland Saturday. "The passengers are absolutely fine. They're all accounted for," said Susan Hayes of G.A.P. Adventures of Toronto, which runs environmentally oriented excursions and owns the stricken MS Explorer. She said the 91 passengers hailed from more than a dozen nations, including 24 Britons, 17 Dutch, 14 Americans, 12 Canadians and 10 Australians. The ship also carried nine expedition staff members and a crew of 54. An Argentine rescue and command center received the first distress call at 12:30 a.m. EST Friday from the Explorer amid reports it was taking on water despite efforts to use onboard pumps, said Capt. Juan Pablo Panichini, an Argentine navy spokesman. A navy statement said that the captain ordered passengers to abandon ship about 90 minutes after the first call and that passengers and crew boarded eight semi-rigid lifeboats and four life rafts, with the captain leaving the ship later. A Chilean ornithologist identified as Paola Palavecino was quoted in an Argentine media report as saying she and others aboard went into the lifeboats before dawn and endured subfreezing temperatures for a few hours until they were picked up about 6 a.m. EST. "The ship took on water quickly," she was quoted by the Argentine news agency Diarios y Noticias as telling a local radio station in a call from the Nordnorge. Throughout the day, Chilean aerial photographs showed the ship listing heavily, its white superstructure and red hull starkly visible against the gray, choppy waters and overcast skies. The navy eventually lost sight of the ship and wreckage indicated it had gone under completely, according to a navy press officer who declined be identified in accordance with department policy. "Our units in the area aren't seeing anything," he told The Associated Press by telephone. "The Explorer is not visible any longer." The Explorer was built in Finland 38 years ago, and has a reputation as being a tough, well-maintained little ship designed for the heavy ice conditions she had encountered many times, reports CBS News correspondent Mark Phillips. It's a mystery how this time, one iceberg could have caused such catastrophic damage. "I think that safety is taken very seriously," said John Warner of G.A.P. Adventures. "All ships that go into that region have to undergo very stringent tests. Obviously the MS Explorer was no exception." The Explorer was on a 19-day circuit of Antarctica and the Falkland Islands, letting passengers observe penguins, whales and other wildlife while getting briefings from experts on the region, according to G.A.P. The tour operator said the voyage was inspired by the Antarctic expeditions of Ernest Shackleton, an adventurer who made repeated forays there in the early 1900s. Shackleton died of a heart attack aboard his ship while trying to circumnavigate the icy continent by sea in 1922. Operators had boasted that the Explorer - a ship only 75 meters 82 yards in length with a shallow bottom and ice-hardened hull - could go places other vessels could not. Nicknamed "The Little Red Ship," it alternated seasons between Antarctic and Arctic waters and was the first cruiser to take passengers to Antarctica and through the Northwest Passage, which connects the Pacific and Atlantic below the North Pole, according to G.A.P. Adventure's Web site. The polar cruiser boasted a shipboard library, lecture hall, gym and sauna, as well as a crew of veteran sailors, bird experts, biologists and naturalists who would brief passengers on adventures along the way. "We strive to show you the real world, by taking you off the beaten track to the heart of the destination and to meet the locals who call it home," the operator's Web site declared. Traveling to Antarctica is always risky, Susan Hayes said. "There is ice in the area. Obviously it's a hazard of the area. But it's highly unusual (that the ship would hit the ice). This has never happened to us," he said. A commander at Chile's air base on King George island confirmed late Friday that the Nordnorge had arrived in a bay near the base, but said waves and strong winds had prevented the passengers from immediately disembarking. He said Chilean air force planes, weather permitting, would fly the survivors on Saturday to Punta Arenas at the southernmost tip of Chile. 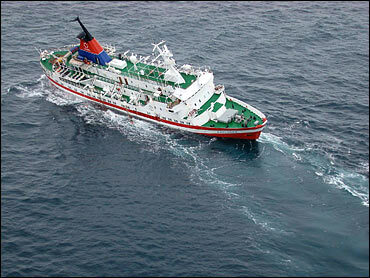 The accident also left a stain of oil covering 3,938 square yards of sea, according to the Chilean navy. An Argentine navy statement said the Explorer was about 475 nautical miles southeast of Ushuaia, the southernmost Argentine city and a jumping-off point for cruise ships and supply vessels for Antarctica. Seas were calm and winds light at the time of the accident, officials said. "It could have been a tragedy," said Pedro Thuay, the head of Argentina's navy in Usuahia. "Instead it was a lucky misfortune." Last Feb. 1, the Nordnorge evacuated 294 passengers, including 119 Americans from a sister Norwegian cruise ship, the MS Nordkapp, which ran aground off a remote Antarctic island. The Nordkapp later pulled off the rocks under its own power and authorities said those passengers were never in danger. CBS News correspondent Richard Roth reports that the Explorer itself played a crucial role in an at-sea rescue operation 20 years ago, when an Argentine supply ship hit a rock ledge.